More information about purchasing our publications can be found here. The 4 volume set of Halyburton's Works can be purchased here. Have we believed in Jesus Christ to the saving of our souls? The grace of God in the lives of His people may have a secret beginning, but its progress ought to be known by its fruits. While ultimately Scripture must validate our profession, we may learn from the pilgrimage of noted Christians. The rise of spiritual concern, the deepening of conviction, the liberty of the gospel, the conflict with Satan, the persuit of holiness and a blessed eternity, all these vital subjects and more are to be found in this volume. This volume contains: Halyburton's Memoirs; Two sermons*; The Obligation of Oaths to Posterity*; A Short Account of Lady Anne Elcho's Death*. A S I write this introduction I have beside me my own copy of Halyburton'sMemoirs. 1 It has been in my possession since the mid-1950s when I was a university student in Australia, and before I began theological studies in Scotland in 1957. My copy bears the inscription 'James Forbes 1848.' He was the first minister of any denomination to be settled in a congregation in Melbourne. He arrived in early 1838 and died in 1851 after thirteen strenuous years of devoted Christian ministry. He was a great reader, and also set up circulating libraries to help meet a need for Christian reading in the colony of Victoria. I have no way of knowing if Forbes added Halyburton's Memoirs to the libraries, but it is significant that he himself had the volume, and so soon after its republication by the Free Church of Scotland its influence was present far away from Scotland. His father was a minister ejected from his parish in 1662, and who died in 1682. Thomas and the eldest sister in the family, Janet, were the only surviving family of eleven children, and their godly mother took him to the Netherlands in May 1685. There they joined other Scottish exiles who found a congenial home and relief from the persecutions in Scotland. Plenty of religious activity was taking place in Rotterdam. On the Lord's Day three sermons were preached, and two lectures were given. On Tuesdays and Thursdays sermons were also preached while on Wednesday there was a prayer meeting. Mr. James Kirkton lectured to his family on Monday and Friday nights, catechising his own and other children on Saturday. Halyburton records that his mother took him to many of these meetings, but they produced no spiritual change in him. "I was weary of them," he writes, "and I went on in sin." He returned to Scotland in December 1686 to live with an aunt in Perth. But as there were no evident signs of religious life in the aunt's family, his mother came in the spring of 1687 and took him back to Rotterdam. He learned Dutch and attended the school founded by Erasmus (1465-1536) where he learned Latin. However, when it was clear that the period of persecution was coming to a close, they returned to Scotland in August, 1687, where he finished his education at school and university. The influence of the English puritan John Owen, whom Halyburton calls 'the worthy Dr. Owen,' was clear on his thinking and probably in the ordered way in which he recorded his spiritual experiences. He must have made notes at the time of the various experiences through which he went, and then drew upon them as he wrote them up in an orderly form. He analysed his feelings and temptations logically, something that was typically puritan as this pattern was borrowed from the thought of Ramus, a sixteenth-century French Huguenot educationist. Ramus taught that analysis was the key to understanding, and so the structure of the puritan sermons and writings was set out in very clear and organised fashion. Halyburton did so with accompanying biblical references. Like a typical puritan he knew all the Bible and quoted from it constantly. During his time as a tutor he was faced with challenges to his faith, and clearly went through periods of doubting the existence of God. It was no wonder that 'Rabbi' John Duncan (1796-1870) of New College, Edinburgh, could find Halyburton's memoirs so congenial, for he himself went through similar temptations. Duncan said that Augustine's Confessions, Bunyan's Grace Abounding, and Halyburton's Memoirs were the three finest spiritual autobiographies. Both Halyburton and Duncan were probably deeply introspective by nature, and struggled with doubts and fears. Halyburton came to the point in his struggles that he recognised God's existence, but he tried to find peace in a wrong way. He wrote: "I yet sought righteousness, as it were, by the works of the law.....I was wholly legal in all I did, not seeing the necessity, the security, the glory, of the gospel method of salvation, by seeking righteousness and strength in the Lord Christ alone.....In a word, all my religion was constrained, violent, selfish, legal, and anti-evangelical." When he came to sure conviction that he was "in Christ Jesus" it was not just one promise from the Scriptures on which he rested. Many promises and testimonies concurred in presenting Gospel truth to him, as the Holy Spirit made the words of Scripture "spirit and life" to him. Like the blind man of John 9, he tells how he certainly knew "that whereas I was blind, now I saw." His jottings on his time as minister at Ceres, and his short tenure of his professorial position in St. Andrews are not so ordered as the earlier parts of hisMemoirs. He records that in the earlier period of his life when he was passing through so many "violent strugglings" he set aside any thought of the ministry: "It was like hell once to entertain a thought of preaching to others what I did not believe myself." However, he had completed two years of theological study and nearby ministers approached him regarding entering the ministry. Finally he yielded to their encouragement and he was licensed to preach 3 at Kirkcaldy on 22 June 1699, and then was settled as the pastor at Ceres on May 1, 1700. He noted the fluctuating feelings as he ministered – sometimes being very depressed in spirit, at other times rejoicing in the blessings he had received from the Lord. Halyburton had often suffered from ill-health but an illness in 1711 left him weakened and he died on 23 September 1712. From 17 September until he died many of his comments and advice to friends and family were recorded by a scribe. Because Halyburton himself did not approve of this, the writer had to remain hidden, and this distance from him and the movement of family and visitors made his task harder. The picture of the scene given as a frontispiece in the Free Church edition of his Memoirs, suggests that he was often sitting up and talking with those who came to see him. He had special words for his wife and children. To his wife he said: "My dear, encourage yourself in the Lord; he will keep you, though you even come among enemies' hands: he will surely cause the enemy to treat you well." In patriarchal fashion he addressed his daughter: "Mady, my dear, the Lord bless you; the God of your father and of my father bless you: the God that fed me all my life, the Angel that redeemed me from all evil, bless you, and the rest, and be your portion. That is a goodly heritage, better than if I had crowns and sceptres to leave you. My child, I got you from him, and I give you to him again." In addition to theMemoirs two further sermons of Halyburton have been appended to this edition, along with a discussion he wrote in 1705 concerning the binding nature of oaths. The final piece is an account of Lady Anne Elcho's death, which while not written by Halyburton, draws upon an original document from his hand. 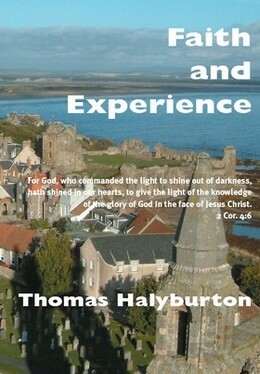 What point has this republication of Halyburton'sMemoirs in particular for Christians in the 21st century? They show us a form of spirituality different from that prevailing in our time. What Halyburton was doing in private is what puritan preaching did from the pulpit. It encouraged people to search and know their own hearts before God, and moved them to trust in Gospel promises. Self-examination prompted believers to acknowledge and confess their sins, with renewed thankfulness for the pardoning mercy of God. This we see exemplified in Halyburton's spiritual diary. The need is for Christians to apply their renewed minds to their spirituality and to learn from the giants of the past how to live consciously in the presence of God (coram deo), seeking to set sin aside and to follow after holiness, without which none of us shall see God. – Professor Allan M. Harman, Wallington, Victoria 2004. (1.) Memoirs of the Life of the Rev. Thomas Halyburton, Professor of Divinity in the University of St. Andrews, with an Appendix, embracing An Account of the Church of Scotland during the Times of Halyburton (Edinburgh: Free Church of Scotland, n.d.). (3.) In the Scottish church following the Reformation licensing was the mark that a student had finished his studies and was equipped to preach. Later it became much more common that students were permitted to preach before being licensed, and so licensing served, and continues to do so in Scotland and Presbyterian churches elsewhere, virtually as an indication that a student's theological course has been completed and that the student is eligible for a call from a congregation.